Coaches still aren’t allowed on-stage during matches, though. Many fans of competitive Call of Duty have longed for the day that coaches will be allowed back on stage for matches—and today’s news could be a step in the right direction. A sixth headset will be added to the main stage for coaches to use in between maps at the CWL Pro League, according to MLG’s Adam Apicella. After assessing feedback we will be adding a 6th headset to the main stage for Pro League to allow for Coaches to more easily communicate with their team between MAPS. We will assess how this rolls out and adjust accordingly for Open events. Apicella made sure to emphasize that coaches can only use this headset “to more easily communicate with their team between maps.” This means that coaches still won’t be permitted on stage for entire matches. During Call of Duty esports’ infancy, coaches were a controversial aspect of several teams. 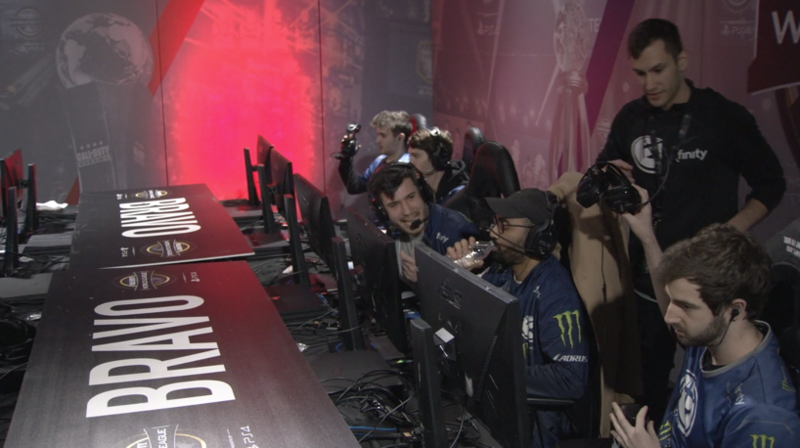 Some squads took advantage of coaches being allowed on stage to essentially have an extra person making callouts, while others simply used a coach as a hype man standing behind them and supporting them (or talking trash to their opponents) through the mic. After not having a major role in Call of Duty esports for a few years, however, coaches have recently become much more important from a strategic and analytic aspect. Even though they can’t stand behind their team throughout an entire series, coaches could still communicate with their players between maps to go over their gameplan or other team’s tendencies. This extra headset might not seem like a big deal to some fans, but it will definitely be a welcome addition to coaches and professional teams—especially after seeing Evil Geniuses’ coach John “Revan” Boble borrow John “Xotic” Bruno’s mic to talk to his team at this month’s CWL Pro League Qualifier. Apicella also reached out to a few coaches on Twitter to see how they’d feel about providing viewers with listen-in segments from these coaching sessions. Although this seems like just an idea at this point, it could be something else that fans would love to hear from their favorite teams and coaches. The 2019 season of the CWL Pro League officially begins on Feb. 4.